How Much Formula Milk Does Your Baby Need? All formula milk comes with instructions explaining how to make up the right amount for your baby. Formula milk is available for different ages of infant and you should make sure your baby is drinking the correct one for his age. Don’t add extra milk powder into your baby’s bottle as this will provide unnecessary calories and may encourage too many fat cells to be produced. There is no precise answer to how much formula milk your baby should be having overall. When your baby is newborn, he will only take small feeds –probably around 60ml at each meal. But this will of course increase rapidly as he grows. The amount of milk a baby needs is generally given as around 75-80 ml for each 0.5kg of body weight. Therefore if your baby weighs 4kg, he would need about 750ml of formula milk per 24-hour period. As a rule, bottle fed babies feed less often than breastfeeding ones. This is due to the speed with which the different milks are digested, formula milk taking longer. On average, your baby will probably feed from the bottle about six times during a 24 – hour period. Bottle Fed babies are rarely underfed, but it is important to feed on demand and not at the times you dictate. Check that the teat on the bottle is large enough for your baby’s needs. It he cries and is upset – especially at the end of a feed, when the bottle is completely empty – then try offering him a little more milk. When your baby hits six months and starts eating solids, the amount of milk he consumes will decrease, as he fills himself up with food other than milk. But if you have any concerns about your baby’s development while bottle-feeding, do talk to your midwife or health visitor. It is more likely that you will try to give your baby more milk than if you were breastfeeding. For this reason, it’s important to let him decide when he has had enough to drink so you don’t overfeed him. While it’s fine to give your baby more milk if he appears unsatisfied at the end of feed, it is bad practice to try and make him finish every last drop if he seems satisfied with what he has already drunk. 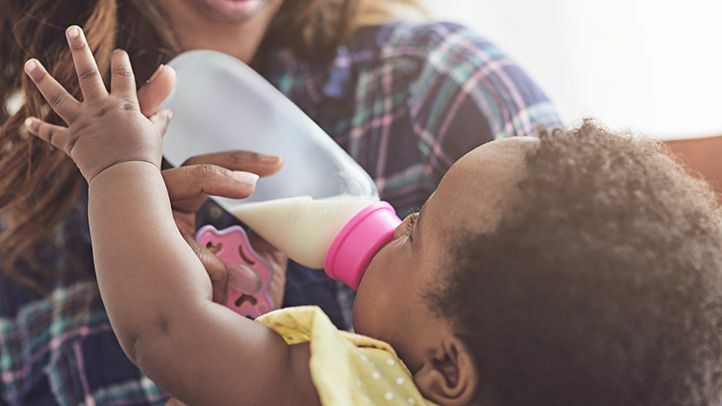 Always follow the manufacturer’s instructions when making up a formula feed to ensure your baby is receiving the right quantities of formula and water. Throw away the contents of any unused bottles of formula milk after 24 hours. Throw away ready-to-feed containers of formula milk after 48 hours once they have been opened. Throw away any formula milk left over after a feed as bacteria from your baby’s saliva may contaminate it.